Many people gripe about their daily commute. For me however, since I moved to Iowa, my morning drive is not really a grind, but can even be a leisure one. I live at the outskirts of the city which is some distance away. I drive 17 miles (27 km) to the downtown hospital where I work, but this takes me only 15- 20 minutes from my driveway to the hospital’s parking lot. (That is a distance comparable from Luneta to Antipolo, and I know that journey is way more than 20 minutes!) The reason for the fast commute in spite of the distance is because it is mostly interstate highway ride, with speed limit of 60-70 miles per hour with not much traffic to talk about. But the best part of my daily commute is the 2 miles country road trip from my home to the interstate freeway. It is winding, and up and down the hills, which make it “interesting” to say the least, when snowing, but it certainly is scenic. It is here where I pass green meadows with cattle grazing, horses’ ranches and stables, creeks and ponds, patches of wooded areas, and stretches of soybean fields and cornfields. The other week, as I was driving to work one morning, I saw a fascinating sight: a cow had her head helplessly stucked out in a wire fence, as I think it tried to reach for the grass on the other side of the fence. That is one of the perils of sticking your neck out, literally. There was of course, plenty of grass on her side of the enclosure. 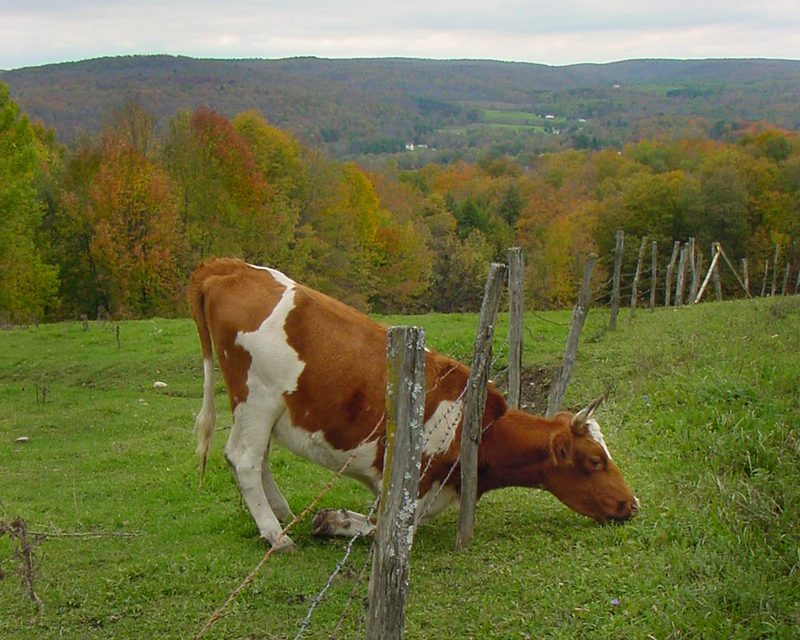 We have heard of the American proverb: “The grass is always greener on the other side of the fence.” I know this is a saying about men’s (and cows’) perpetual discontent. But is it wrong to wish for greener pastures? Why is the grass greener at the other side of the fence? Sometimes, this is not a mere rhetorical question. For sometimes, it is the truth. And I am speaking from a perspective of a “transplant” like me. With all the OFW’s and expats from the Philippines, sadly to say, it is more than a diaspora. It is an exodus. I know that’s not good for our motherland. But how can we stop this drain? Can we blame our countrymen from looking at the other side of the fence? This is not a matter of the grass being ‘greener’ on the other side. For many, there is plainly no grass in their side of the fence! Being away from my native land though, makes me yearn for home. Even after many years of living on the other side of the fence, I still feel the pangs of homesickness. However, unlike Tom Jones, I cannot sing his nostalgic song of homecoming, “Yes they’ll all come to meet me, arms reaching, smiling sweetly, it’s good to touch the green, green grass of home”………for there is none. I just hope that people in their pursuit of some greener pastures, would not have their head stucked, like that cow, on the fence.